LAKE PLACID, N.Y. – The 39th running of the Empire State Winter Games, presented by Community Bank and supported by I LOVE NY, will bring the spirit and excitement of traditional and adventure winter sports competition back to the North Country and Adirondack regions of New York state. From Jan. 31 – Feb. 3, over 2,300 athletes of all ages from across the state and beyond are expected to participate in more than 30 sports, giving these amateur athletes the chance to compete on a world-class stage. The arena will begin to glow as all of the athletes’ parade in wearing LED bracelets that are timed to the music, a new addition to this year’s event. Spoiler alert: one bracelet will turn a different color than the rest. The wearer of that bracelet will be given the honor of lighting the cauldron, signifying the opening of the Games. 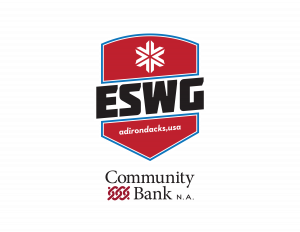 As the headquarters for the Games, Lake Placid will once again welcome the public to the ESWG Village, which was relocated to Mid’s Park on Main Street, drawing crowds to the heart of Lake Placid’s downtown district. The family-friendly village is open Friday and Saturday from noon – 7 p.m., and Sunday from 10 a.m. – 1 p.m. Award ceremonies will be held there daily, along with free hot chocolate, s’mores, music, and games. After the resounding success of last year’s torch relay, organizers announced this year’s version is expanded and will now include two routes — one beginning in Buffalo and one from New York City — that will meet in Malone, thus uniting the state of New York before traveling together to the opening ceremony. The Empire State Winter Games is a community-driven event, courtesy of a partnership between the Regional Office of Sustainable Tourism (ROOST); the towns of North Elba, Wilmington, Tupper Lake, Harrietstown, Malone, and Brighton; the villages of Lake Placid, Tupper Lake, Paul Smiths, Malone, Wilmington, and Saranac Lake; the counties of Essex and Franklin; the New York State Olympic Regional Development Authority, and New York State Senator Betty Little. Sport venues are located in Lake Placid, Wilmington, Saranac Lake, Tupper Lake, Malone, and Paul Smiths. Venues include: Lake Placid Olympic Center Herb Brooks Arena, Lake Placid Olympic Jumping and Sliding complexes, Mid’s Park in Lake Placid, Whiteface Mountain, Paul Smith’s College, Paul Smith’s College VIC, Saranac Lake Civic Center Ice Rink, Dewey Mountain Recreation Area, Tupper Lake Memorial Civic Center, Olympic Cross Country and Biathlon Center, Titus Mountain, and Mount Pisgah. For more information, visit EmpireStateWinterGames.com.